In Eiji Aonuma’s recent interview with Official Nintendo Magazine, he talked more extensively about the artwork style for the upcoming Legend of Zelda: Skyward Sword. In particular he touched on how he believes the graphic style will help the core gameplay of the game. 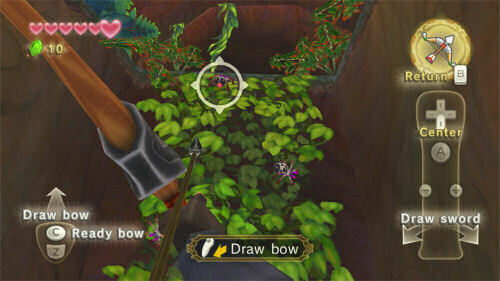 From what I’ve seen thus far with Skyward Sword, I really like the enemy models and the art style in general. I have no problem with what is considered the over exaggeration of the enemies, in order to develop specific gameplay elements. I think it is very innovative and I’m excited to get my hands on the game. That being said, I also feel the graphics are not just good for pure gameplay mechanics, but I think that just plain and simply look better. This is a game that is being developed for the Nintendo Wii, so if it did go for purely realistic graphics, it would be compared with games on other consoles, of which critics would immediately jump on the fact that the graphical output of the game is not up to par with other games on the Xbox 360 or PS3. However, with the choice they’ve gone with, I personally think that the graphics turned what is a weakness of the Nintendo Wii, to something that looks unique and in time will make graphics a non-issue with Skyward Sword. Skyward Sword is set to release in early 2011 and here at Zelda Dungeon we will be providing a complete Skyward Sword Walkthrough upon release. Be sure to bookmark that page and to check back often here at Zelda Dungeon for all the latest on the upcoming Zelda title for the Nintendo Wii.